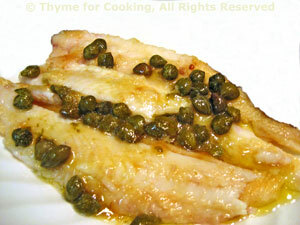 Sole with Capers and Lemon, Thyme for Cooking easy gourmet recipes. When you open the Mozzarella, drain the liquid into a container, and store the rest of the mozzarella in it, covered, until tomorrow. Sole is a delicate fish that cooks in minutes. The Lyonaise are from the second (some would say first) gastronomic capital of France: Lyon. 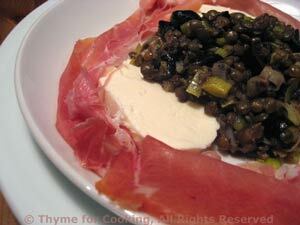 For salads I use the tiny green French lentils 'du Puy'. You could use the larger brown lentils but not the pretty red ones. If you can't find Mozzarella di Bufala, regular cow's milk mozzarella will be fine. If you are having the Prosciutto sliced to order (rather than buying pre-packaged) it should be 'paper-thin'. Rinse and pick through lentils (in case quality control missed the odd stone). Put in a small sauce pan along with stock and water and bring to a boil. Reduce heat, cover and cook until done - about 20 minutes. Taste to determine when done properly. Drain any excess cooking liquid and set aside to cool slightly. Heat 2 tsp oil in a small skillet. Add paprika, onion, celery, garlic and sauté until tender. Slice 4 small slices off of the Mozzarella, reserving the rest. Slice the Prosciutto in half the long way. Whisk together the oil, vinegar and herbs in a bowl large enough to easily hold the lentils. Add the lentils and mix well. Add the onions, celery, garlic and stir. Divide the lentils and mound onto two serving plates. Lay 2 slices of mozzarella on either side and arrange the Prosciutto around the edge. Serve. 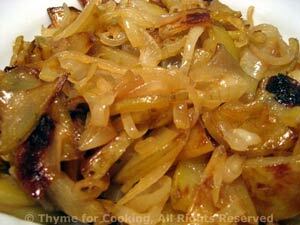 Sauté onion and garlic in medium nonstick skillet in 2 tsp butter until lightly golden, about 10 minutes. Remove onions and garlic from pan. 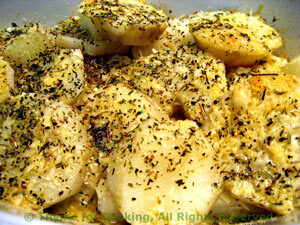 Add 2 tsp oil, potatoes and sauté until golden, turning often with spatula, about 20 minutes. When potatoes are golden, return onion and garlic to pan, add chicken stock, cover and simmer until stock is absorbed, 5 - 10 minutes. Serve. These gnarly roots are delicious and easy to fix. Select sunchokes that are firm and with fewer rather than more knobby bits. There is no need to peel, but scrub well. Trim any big knobs if you like. Leave whole and put into a steamer basket over hot water. Steam 15 minutes or until just tender when pierced with a sharp knife. Watch them - they go from barely done to over done quickly. When done remove and cut into 1/2" (1.25cm) slices. Lightly oil a small gratin dish. Layer the sunchoke slices in dish. Sprinkle with herbs and Parmesan. Drizzle the remaining olive oil over the top. Bake, 400F (200C) for 10 - 15 minutes, until golden brown. Remove and serve.